Synopsis: A man is tasked with delivering $150,000 of his deceased father’s fortune to the sister he has never met. 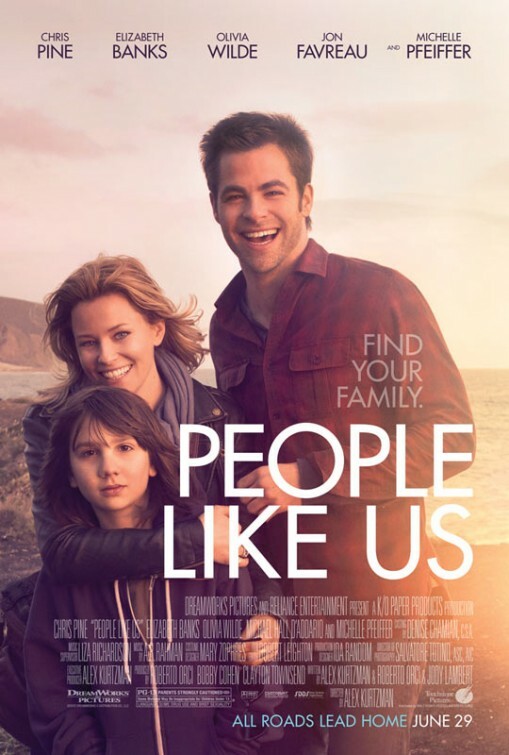 Review: Based on the trailer for People Like Us, it would be easy to dismiss it as just another syrupy drama that would be more at home on the small screen as a Lifetime Television Movie or a Hallmark Hall of Fame. What sets the movie apart from standard TV fare are the performances, soundtrack, and stylish direction that lets the film play out in a naturalistic way. It’s schmaltz, no doubt, but it’s involving schmaltz. I’m going to detail the plot a little more than I normally would…it’s not my style to waste your time retelling the entire plot like some movie review blogs but I feel it’s necessary in this case. It’s a rocky first half hour or so as the film struggles to find its way to the heart of the matter. These opening moments had my mind wandering back to Rain Man as it showed its handsome star hustling and flowing with various clients. It’s clear that wholesaler Sam (Pine) is good on the sale but lousy on the follow through and he’s quickly in hot judicial water with his company. How he gets entangled and pinned up against a wall so quickly is made possible by a not very well thought out plot device…and even though this legal subplot pops up conveniently from time to time it’s thankfully not much of a focus. Even the death of his father can’t snap Sam out of his own little world and he winds up heading to CA for the funeral with his girlfriend (Wilde) in tow…another plot device that is fairly weak. How, for instance, does Sam end up missing his dad’s funeral when he seemingly was one of the first people to hear of his passing? It’s probably best not to get too wrapped up in what gets Sam to CA because the film really begins the moment he enters his childhood home. It’s clear that Sam has parent issues – his lack of emotion over the death of his father and the way he cooly greets his mother sets off all the appropriate warning bells and whistles. Reuniting with his mom Lillian (Pfeiffer…gorgeous as ever…even better than in Dark Shadows) he answers all her standard catch-up questions and makes it clear he’s not home for a lengthy visit. Meanwhile the film introduces us to Frankie (Banks) a tough talking, short-skirt wearing, single mom straight out of the movie stereotype cookie cutter. It’s a tribute to Banks that she breathes some fresh life into Frankie – so much so that the character we’ve seen in countless movies somehow becomes unique to Banks and the film. With each passing movie Banks magically makes herself the most memorable character and she’s three for three in 2012 (The Hunger Games, What to Expect When You’re Expecting…I’m going to conveniently forget she was in Man on a Ledge). Frankie coincidentally has also just learned that her father passed away and yep, you guessed it, it’s the same dad that Sam felt abandoned by and neither knows the two exist. Both Frankie and Sam never felt they knew their father but a last request from their dad passed on to Sam brings the two together and it’s this plot thread where the movie creates some nice moments. Sam’s dad has left $150,000 that he wants to go to Frankie and wants Sam to deliver it. Now, Sam being the businessman he is and facing jail time for a botched business deal he considers keeping the money for himself, a consideration that conveniently angers Hannah enough to catch the first plane home. It’s at this point where the movie introduces my least favorite plot device: The Secret Someone Keeps To Themselves For No Other Reason That To Have Something For Someone To Get Mad About Later. It’s an oft-used tool to create tension and set-up a films third act. Still, since this isn’t a romantic comedy the only danger that Sam faces is never getting to know his half-sister or her impressionable son (D’Addario in a nice twist to the Son of a Single Mom role) but it’s a risk he’s willing to take and the audience has to go along with. In getting to know his sister and becoming a pseudo father figure to her son, Sam learns much about the bonds between parents and children and his own worth as a person. It’s not a terribly original concept but it’s molded into a winning one by a well-assembled group. In fact, the group is so good that as the movie begins to draw to close and some somber stuff is presented, it’s not done in a manipulative way. Pine hasn’t really been given a huge chance to show his dramatic side and in this film he dips a few toes and an elbow into the non-action movie territory with mostly good results. His slightly crossed eyes and all American good looks convey a grounded nature that works well for Sam. While it may be hard to believe that Pfeiffer could be his mom, she turns in a graceful performance as a mother and a wife who is more aware than it may originally seem. Banks and D’Addario play off each other nicely and it’s interesting to see their relationship shown in parallel to Pine and Pfeiffer. People Like Us could be viewed as a four person film because it rarely looks outside our central characters for inspiration. Wilde seems more like window dressing and it’s unfortunate that she’s only called upon to be the voice or reason or the gnat in Sam’s ear…but she’s much more tolerable than the grating Jon Favreau who shows up to say about 10 lines at the beginning and is never heard from again. That he made it to above the title billing on the poster is a miracle of contract negotiations. Director and co-writer Kurtzman helms his first feature film after cutting his teeth as a writer and producer of such blockbusters as the Star Trek reboot (where he met Pine), the Transformers series, and Cowboys and Aliens. With those action films in his canon it’s a nice surprise that his first movie is one that feels very personal. The music selection and obvious love of California off the beaten path scenery are signs that this director has taken his job very seriously. It’s quite a good-looking film and has been put together in a fashion that goes down pretty easily. With its late June release date, one could view People Like Us as a smart move of counterprogramming. In the middle of all the blockbusters and bombastic explosions in the theaters, this is a slight but overall charming effort. The characters and plot may feel overly familiar but it’s in the assembly of these familiar pieces that a nice picture develops. Very thorough exploring of “People Like Us”.